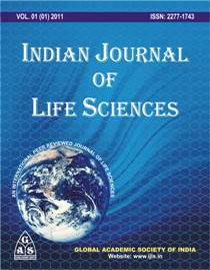 Indian Journal of Life Sciences is the official organ of Global Academic Society. This Journal is published biannually in month of January and August (Print Version) . Annual Subscription Rate : For individual is Rs.700/ in India and other Countries is US $80. For Institution / Libraries/ Other Corporate bodies is Rs.2500/ in India and Other Countries US $200. Annual subscription of the journal is the calendar year i.e. from January to August. Life Subscription Rate : For individual is Rs.10,000/ in India and Other Countries is US$ 1250. For Institution/ Libraries/ Other Corporate bodies is Rs. 15,000/ in India and Other Countries is US$ 5000. The life membership of IJLS valid up to for 10th Years only. Rupees prices valid in India. All the payments should be made only through Bank Draft only in the name of Indian Journal of Life Sciences payable at Lucknow.